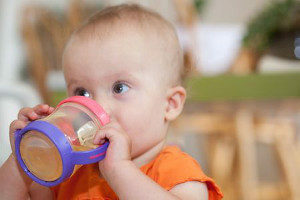 Sippy cups are essential in the transition of babies or toddlers from bottle feeding or nursing to a drinking cup. Therefore, it is important you choose the right type of sippy cup by identifying vital points such as safety, eco-healthy, and efficiency. If you find the perfect cup, this can help minimize frustration for parents and toddlers. The right sippy cup limits the leaks and spills, it is clean, offers a healthy attribute for the development of the body of the child and it is easy to drink from. So, how do you choose the right sippy cup? It is in accordance with the different points or metrics stated below. Is it really necessary to use a leak-proof cup? This type of cup does not actually help in bridging the gap between bottle drinking and drinking to a normal cup. However, leak-proof cup allows toddlers to help themselves drink lots of liquids without the mess, which is a concern when using a regular cup. This type of cup helps toddlers stay hydrated. Sippy cups provide convenience for toddlers to experience independence without parents having to worry about cleaning mess or stains. Its transportability, enables toddlers to carry and transport their cups without spilling any fluids from one area to the other. Any cup that limits spills and can easily be carried without spilling and less likely to break is appreciated by most parents. Transition Cup: This type of cup has softer spouts that are easy on sensitive gums holding less than 8-ounces. The transition sippy cup is for babies between the ages of 4 and 12 months. Its dual handle, makes it easy for babies to lift, grasp, and control. Toddler Cup: This type of cup is slightly larger since it holds between 7 and 12 ounces of fluids and best for 12-month-old babies up to 3-year-old toddlers. The toddler sippy cup has a contoured body shape or a longer and thinner cup design. This helps children hold the cup without the aid of handles. Toddlers stay hydrated in this state, while parents will have no worries on spills and stains. Kid Bottle: Children 3 years and above use kid bottles, which hold even more liquid compared to the other cups mentioned. These cups or bottles are insulated keeping contents cool for long durations. They have straws that are flexible or hard spouts. Shorter and Contoured: These types of cups are very easy for toddlers to hold due to textured sides that provide additional grip factor. However, it can only carry or hold little liquid as compared to taller cups. Tall and Slim: This allows the hands of little children to grasp firmly the body of the cup. These types of cups scored higher on tests compared to other styles. 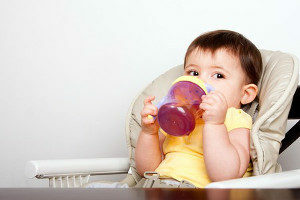 Squat and Wide: This type of cup has a wider bottom helping toddlers to easily set them down. However, they only carry a little fluid and toddlers only learn a few skills from using it. This style scored low compared to other styles. Different toddler cups are made of different materials. Some cups are made of plastic. However, most cups use a combination of materials. Eco-health metric is an important determinant when choosing the appropriate sippy cup for a toddler. Below are the different materials essential in making an excellent sippy cup. Plastics: Plastics are lightweight, user-friendly, inexpensive, and versatile that is why it is often used in leak-proof cups. But, there are health-concerns when using plastics such as the concern on BPA, which was believed to leach chemicals that cause problems to children. However, statements were released that plastics became “BPA-free,” but, some studies implied that even if plastics are BPA-free, it can still potentially leach chemicals and are unsafe for children to use. Stainless Steel: This type of material is a healthier option compared to plastics. It is also more economical and durable since it has a longer shelf-life compared to plastics. Stainless steels do not leach chemicals or other elements and it does not break or shatter compare to glass options. It is a good option for leak-free cups, it is easy to clean, and keeps contents cool. Stainless steel is a better choice for toddlers, however, it can be heavy, especially if it is insulated. Glass: This type of material is recyclable. It does not contribute chemicals to its contents and it does not allow nutrients to cling to its surface. However, it may break or shatter when used by toddlers. But some glass sippy cups have a silicone type of sleeve that prevents the glass from shattering. This type is better suited for older or stronger toddlers. Silicone: Silicone is considered to be a safe material to use in the different parts of the toddler cups such as the outside sleeve, valve, and spout. It is a good material that allows valves and spouts to be more flexible and mouth-friendly compared to plastics. However, studies showed that silicone can break down when heated, so it would be best to hand wash all silicon straws, spouts, and valves. Pura Kiki Toddler is eco-friendly since it is made of the combination of steel for the body and collar and silicon for the spout, therefore it is also durable and healthy. It has a simple design, interchangeable spouts and easy to clean. However, it is expensive and reported some leaks. Sassy Grow Up Cup has a unique design and it is easy to drink with 360 drinking options. But it has a low eco-health score, and it is hard to clean the inner leak-proof seal. Lifefactory Glass Sippy got a high score on the glass cup test and came with a silicone sleeve. It is considered as eco-healthy and provides easy drinking. However, it is heavier compared to other cups and a bit higher than average price range. Little leaks have been observed, as well. Munchkin Click Lock Insulated has audible click lock feature, easy to clean and has a slim cup shape with an attractive price and it is leak proof, as well. However, since it is made up of plastic, it is somewhat difficult to drink from. Tommee Tippee Sporty Bottle comes in different body styles and graphics at a cheaper price. It is 100% leak-proof, economical and easy to drink from. However, accumulation of mold poses health issues. There are different types of sippy cups as stated above, however, the Kangovou Sippy Cup differentiates itself from the rest. It is insulated to keep drinks either warm or cold, apart from its airtight cap and lid that keep the drinks fresher for a longer period. It prevents condensation. It easily fits into cup holders and not too bulky for the little hands of toddlers. Moreover, another important feature that makes it stand out from the rest is the promise of safety, wherein it is 100% BPA-free, unlike traditional plastic sippy cups that contain harmful chemical compounds. It is also, PVC-free, phthalate-free, lead-free, and melamine-free. The Kangovou sippy cup holds up to 236 ml or 8 oz with a leak-proof cup. It has a straw that can easily be cleaned and removed. Lastly, it is durable, rust, and stain resistant. It is then important to take into account the different factors when choosing the right sippy cup for your kid. Efficiency and safety considered, use only the right sippy cup that provides your family a superior healthy option.